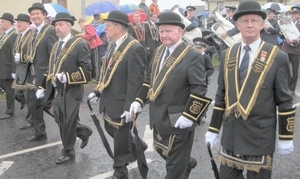 The Grand Black Chapter of Ireland was established in 1797, two years after the Battle of the Diamond, which had led to the formation of the Orange Order. During this period there was a great threat to Protestantism. While the Institution has a strong religious foundation, firmly based on the teachings of the Holy Bible, its members have no illusions about the gulf that exists between Protestant and Roman Catholic doctrines and opinions – a gulf that continues to dominate political and religious life in Northern Ireland to this day. The Royal Black Institution was formed in September 1797. This Order of Christian Knighthood evolved from earlier Orders of Chivalry which flourished in the times of the Crusades and in early Reformation days. Since its inception the Institution has spread to and developed in Scotland, England, Canada, Australia, New Zealand, the United States of America, Ghana and Togo in West Africa. The tiered structure of the Institution has as its foundation the local Preceptory (lodge). This unit elects officers who represent their membership at the next tier, namely a District Chapter. The District Chapter Officers form a County or Provincial Grand Chapter. The officers of these units constitute the membership of the governing body know as the Imperial Grand Council. This Council is recognised by all members of the Imperial Black Commonwealth; which is the Title of Institution; as being the supreme authority with the Sovereign Grand Master as the head of this International organisation. The administrative offices are located at Brownlow House, Lurgan, County Armagh. The aims and objectives of the Royal Black Institution are solely based on Christian teaching as found in Holy Scripture and on the principles of the Reformation and is therefore non-political. The members are encouraged to study the Scriptures and to participate fully in the life and witness of the Christian Church. They are also encouraged to act charitably and to be good citizens of their respective countries. Introduction by Sir Knight Robert Wallace Worshipful District Master of Portadown Royal Black District Chapter No 5. 1 - To spread the message of Jesus Christ Crucified, and Risen again for the Salvation of all mankind. 2 - To promote the (The Mission Statement of the Royal Black Institution) and the (Ideals of a Sir Knight) as stated forthwith. 3 - To promote the Charitable outreach of the Royal Black Institution in general and this District Chapter in particular. 4 - To research the history of this District Chapter and it’s Preceptories. 5 - Provide pictures and items of interest in Royal Black matters. 7 - Include other items of scriptural interest. N.B. Portadown, Co, Armagh, is situated beside the river Bann, quite central in Northern Ireland, which is an integral part of Great Britain, it is often referred as the Hub of the North. It is inhabited in the main, by a kind and generous people, who are renowned for their Hospitality. We would heartily invite to sign our Guest book , your comments or Contributory Articles would be most welcome. Wishing you all God’s Richest Blessing.